The league seeded its teams based on regular-season performance and advanced them to the Class 3A SeaKing District tournament, which begins Saturday at various sites. Playoff basketball was put on ice this week as high schools dealt with snowy conditions across the region. The Metro League suffered the biggest hit as officials were forced to cancel its boys and girls tournament, including the games scheduled to be played at the University of Washington’s Alaska Airlines Arena on Wednesday and Friday. Instead the league seeded its top seven teams based on regular-season performance and advanced them to the Class 3A SeaKing District tournament, which begins Saturday at various sites. The remaining two district seeds will be determined if school’s open Wednesday. For the boys, Cleveland will play Bishop Blanchet while Franklin plays Seattle Prep to advance. For the girls, Rainier Beach faces Holy Names and Bainbridge plays Bishop Blanchet for the final district slots. “It’s a little disappointing,” said Garfield girls basketball coach Marvin Hall of the cancellation. He was an assistant coach for Nathan Hale’s 2017 boys team when it defeated West Seattle in overtime at UW in a Metro League tournament semifinal matchup. McDonald’s All-American Michael Porter Jr., who was drafted by the Denver Nuggets, scored 42 points for the Raiders. Garfield, which is fourth in The Seattle Times’ girls rankings for Class 3A, was awarded the Metro League championship and No. 1 seed. It advances to the SeaKing District quarterfinals to be played Tuesday at Sammamish along with second-seeded Seattle Prep (13-2) and third-seeded West Seattle (12-3). 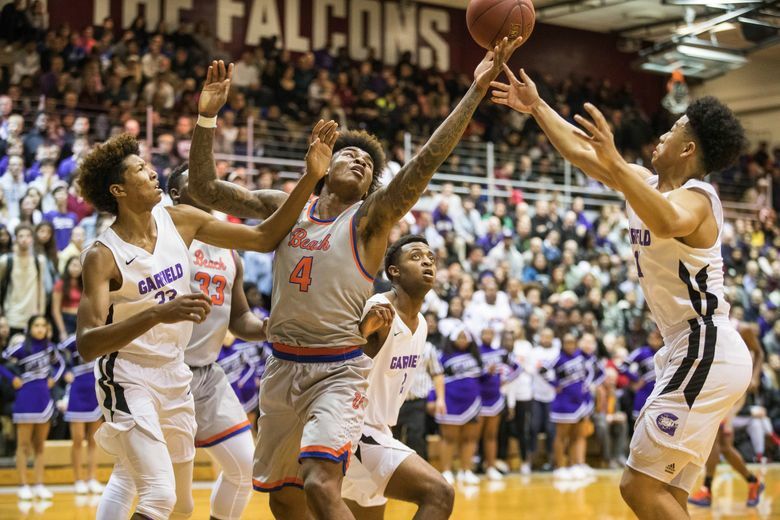 Top-ranked Rainier Beach (16-4) was awarded the boys Metro League championship and advanced to the SeaKing District tournament quarterfinals with second-seeded Eastside Catholic (20-1) and third-seeded O’Dea (14-6). Those games against to be determined KingCo 3A opponents are also Tuesday at Sammamish. The Crusaders hoped for a rematch with the Vikings for the coveted league crown after a 70-66 loss at Beach on Jan. 31. The possibility was also a selling point for the championship lineup at UW on Friday. Organizers said neither the Metro League nor Seattle Public Schools incurred any costs due to the cancellations. KingCo 3A and the West Central/Southwest bi-district tournaments postponed their games set for Tuesday. The KingCo’s athletic directors met Tuesday evening to discuss contingency plans if school is canceled again this week. Which is likely. The National Weather Service in Seattle is predicting another cold system to bring more snow Friday.